Memebers of the hotel workers' union Unite Here! Local 5 march through Waikiki Beach. Several of the hotels being picketed are located in the iconic-resort destination. It’s been one week since 8,000 workers at Marriott Hotels walked out on strike in eight cities around the country. Here in Hawai‘i, 2,700 workers are on the picket lines outside five hotels managed by Marriott and owned by Kyo-Ya. They are demanding higher wages, protections against sexual harassment, and guarantees about not being replaced by automation. Union members have been working without a contract since July. Local workers voted to authorize a strike in September, and last week their counterparts around the country walked off the job. At present, neither Marriott or Kyo-Ya has reached out to Local 5 to schedule negotiation talks. The last time a major hotel strike took place in Hawaii was 1990, when 8,000 workers from 11 hotels picketted for three weeks. That dispute mostly centered on pension benefits for workers. That length of time is significant according to Keith Vierria, a hospitality industry consultant with Honolulu-based KV and Associates. According to Vierria, a quick resolution is in the best interests of both sides but management has an advantage as the strike wears on. That is because managers will often bring in additional labor to replace striking workers, where as workers are typically enduring reduced incomes. VIerria identified the 20-30 day period as when the dynamic begins to shift from a stalemate to being more in the favor of management. If histroy is any indicator, the strike will eventually be resolved through some sort of negotiated compromise. Locally that has been the case in the hotel industry, but not alwayus so in other strikes. In 2007, meat cutters with Times Supermarkets went on strike over medical benefits. As that walkout dragged on, management opted to replace striking workers with new hires. Those new workers eventually voted out the union, Teamsters Local 996, and everyone who did not return to work was fired. That story was recounted by Ken Kawamoto, Director of Negotiation Services for the Hawaii Employers Council. In that case, management's actions were entirely in accordance with the National Labor Relations Act, which grants the rights of workers to unionize, strike, and engage in collective bargaining. How a management and labor reach an agreement can vary from case to case. Often a federal mediator will be called in to broker a compromose. As the current strike enters its second week, there are still no plans to negotiate an end to picketting. 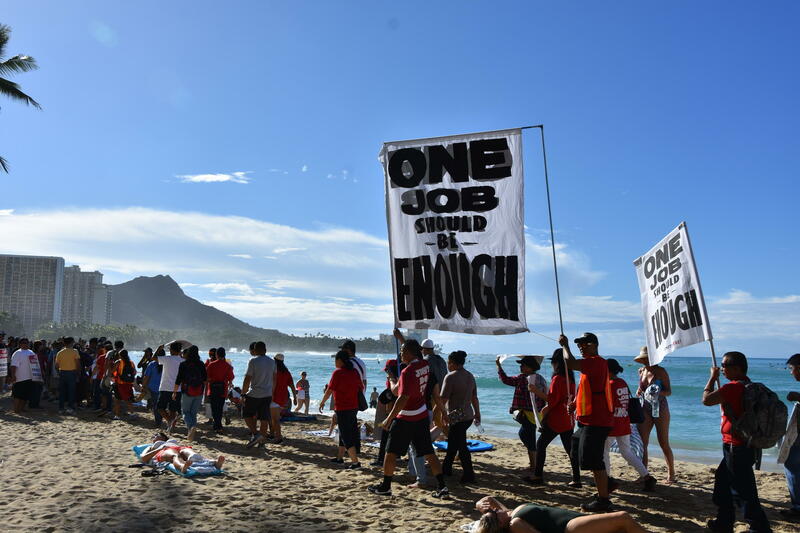 2,700 Marriott Hotel workers went on strike this morning in Waikiki and Maui. Unite Here Local 5 union representatives asked for a three dollar raise and hotel negotiators countered with 30 cents. It may feel like the era where robots can truly replace humans is far off, but it may be closer than you think. At the Global Tourism Summit in Honolulu this week attendees got to listen to a conversation between a human and a highly advanced artificially intelligent robot. It’s Labor Day. For some this means a long three-day weekend. But across the United States, it’s a celebration of worker rights and the labor movement. HPR’s Kuʻuwehi Hiraishi takes a look at a pivotal moment in Hawai’i’s labor history and how it shapes our lives today.